Nitra Castle has four main parts: the Cathedral, the Bishop´s Palace, Service buildings and Castle Fortification. It is situated on rocky hill and the first settlement of this territory dates to the 9th century, first written records of the castle are from 871. It was constructed in the times of the break-up of the Great Moravian Empire and its present appearance results from several centuries of development, nowadays it mainly looks as it looked in the 17th century. Park with the sculpture of Sts. Constantine-Cyril and Methodius, the Marian Sculpture (Black Death Column) and a stone bridge embellished by sculptures of saints will lead you up to the main gate of the Castle, whose Cathedral is one of the most precious historical monuments. Its oldest part is the St. Emeram´s Church constructed in the 11th century. The Cathedral is the place of regular church services, and because it is so beautiful, many young couples decide to say their “I accept” just here. In 1241 resisted to the Turkish invasion, later on it was destroyed by fire and in the 14th century was not only conquered, but also damaged by Matthew Csák of Trenčín. The Gothic fortification was constructed in the 15th century and one century later was other fortification added in order to protect the Castle against the Turks. In 18th century was constructed the Bishop´s Palace. 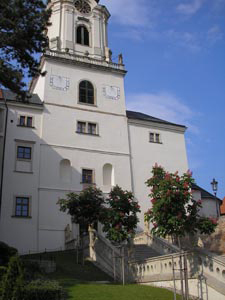 Nowadays the Castle serves as the seat of the Bishop and the Archaeological Institution of the Slovak Science Academy. Walking along the Castle you can have a look at the courtyard and see a beautiful view of the city. Climbing the stairs you get to the Cathedral behind which is hidden a well, historical ruins, and through little windows you can see the neighbourhood of the castle. Thanks to its position, the Castle is well seen from very far, so you will find it easily. When you are walking through the centre, you just head toward Region House Square. Next to the Region House you find a gate that is the main entrance to the Pribina Square, from which you will get straight to the Castle. When you are driving a car, you have to leave it on the car park before the main gate on Region House Square, on Farská or Mostná Street. It takes about 20-30 minutes walking from the Bus and Train station. You just walk straight along the main street, through the pedestrian zone to the Region House Square. The entrance to the Castle´s courtyard is opened to the public without any limitation all year. For more pictures visit our photogallery.